The vision of The Broomhouse Centre and Enterprises is to regenerate the Broomhouse, Sighthill & Parkhead area of Edinburgh, one of the areas of highest relative deprivation in the city; and this development will be central to re-energising this. We aim to create a centre that will be a real anchor for the community and a catalyst for change. Our aspiration is for the new facility to be a busy hub of community activity that will stimulate social and economic regeneration. We want to establish a community-owned, managed asset that changes in response to need over time. You can help support the Broomhouse Centre by buying a brick and by spreading the word about our ‘Buy a Brick’ in Broomhouse Campaign so that others can by bricks too! We launched the campaign in February 2018 and we’re very pleased to say that the first bricks are selling and we are really encouraged to be getting many messages of support. You can buy a brick for just £10, or 10 bricks for £100. 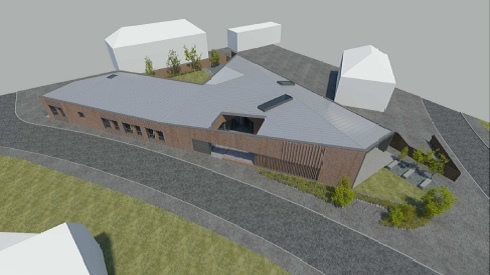 We are looking to demolish our existing building, located at 79-89 Broomhouse Crescent, Edinburgh, and construct a new community centre on the same site to accommodate our various community initiatives. The existing premises are cramped, inflexible and no longer adequate to support the range of activities undertaken by the organisation. The proposed development will provide purpose-built, flexible space assisting the Centre to more fully meet the needs of the community, our clients, employees, volunteers and partners. This has been a 5 year journey so far and we continue to work hard on creating this special new place that will be a focal point for the community. If you wish to discuss sponsorship, or corporate sponsorship enquiries: please contact Bridie Ashrowan, CEO – email bridie@broomhousecentre.org.uk or phone 0131 455 7731.